Only the best Grapes of this noble variety is used for the Chardonnay Grande Reserve , by all Paul Mas. These are from the La Valette and l'Entre Deux Eaux vineyards in Languedoc. It spends 6 months in barriques, French and American oak. The result is a very intense and full-bodied white wine, which, in addition to the barrique notes, is reminiscent of ripe exotic fruits such as pineapple and mango, also a touch of coconut is found. An impressive appearance on the palate. 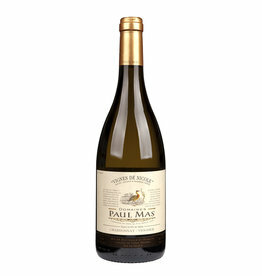 We recommend it as an ideal wine for white meat dishes, poultry and seafood.